It looks like there is a resort boom in the North. 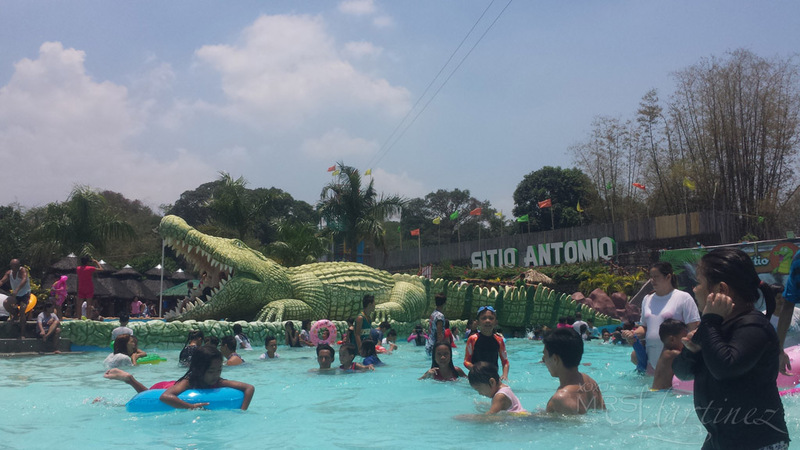 Aside from Klir Waterpark Resort, Sitio Antonio is the newest addition in the Wavepool Resort category to open in Bulacan. 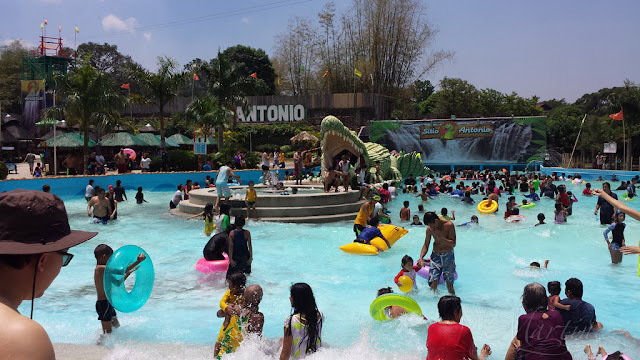 One bright sunny morning, my family and I decided to go there for a day of fun under the sun. The location was pretty close to Manila, about 20 minutes away from Balagtas Exit. That's one reason why DH wants to drive to the North instead of South (read: Batangas) where traffic is unbearable. Ice Age characters greeted us on our way in. I spy Diego, Manny, Sid and Scrat. 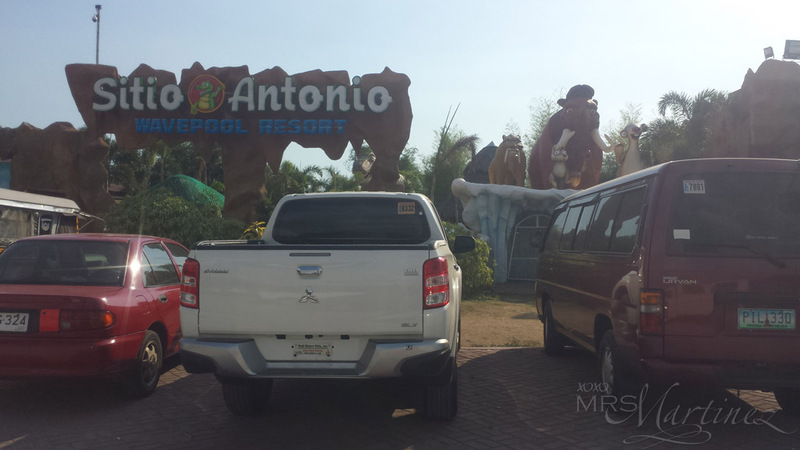 At about 9am, the resort's parking area was almost full. We were lucky enough to find a spot within the gates of the resort. Otherwise, parking is available outside the gate. 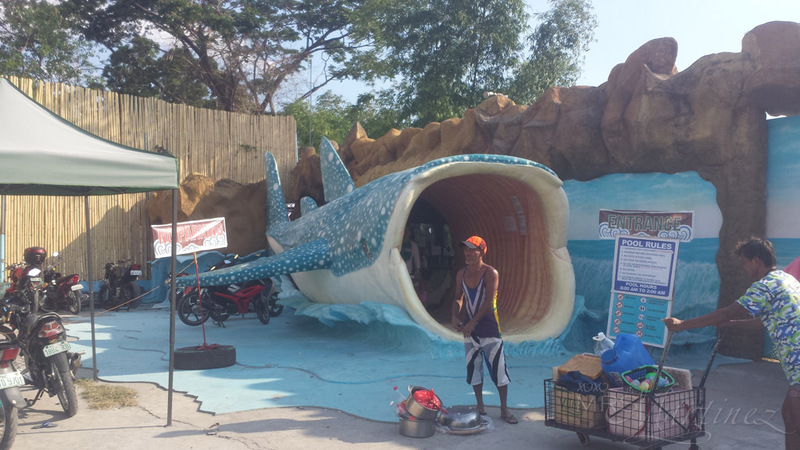 The huge whale is the entrance to Sitio Antonio. This photo was taken as we were leaving the premises. Earlier during the day, the entrance was packed with families waiting for their turn to pay the admission fees. The line was pretty long. I think the administration should reassess the procedure of collecting fees. The process was time consuming because you have to line up three times... yes, THREE! Step 1: Get a paper from the tent on the left (see photo above). The personnel lists down the total number of adults and child. 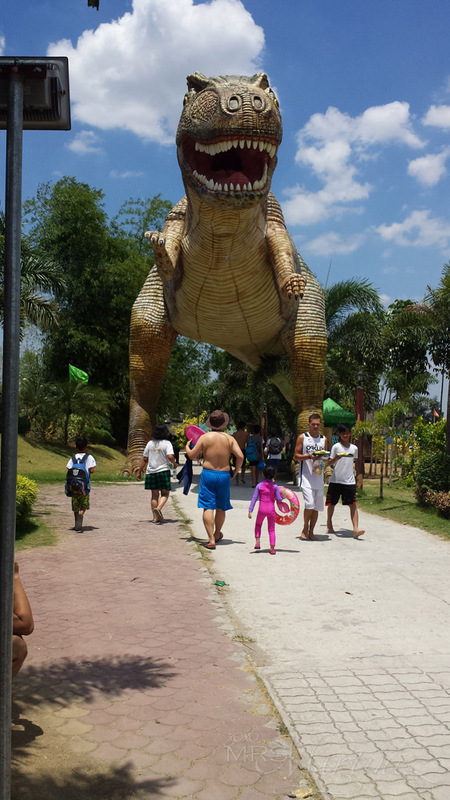 The lifelike dinosaur was huge. I initially thought my daughter would be scared of the huge structure. But surprise, surprise she seemed unmindful of the intimidating character above her. I spotted a First Aid station as we walk towards the wavepool. A lot of people were getting treated because some parts of the resort has very sharp edges. Just imagine, my daughter's floater was damaged when she went from one pool to another. Oh, and don't get me started on her Speedo. It was ruined! Lolong Wave Pool, named after the largest crocodile in captivity, mimics a raging river on one side and a wave-dominated beach on the other. The whole resort is uncovered. Be sure to get a very high SPF sunscreen and wear a rash guard like the one you see on the woman on right. 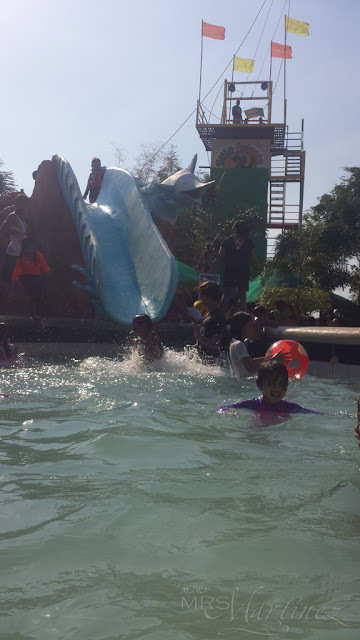 My daughter spent most of the time at the jacuzzi area located at the open mouth of the crocodile (see center photo). But that's not where she got her floater damaged and her swimsuit ruined, it was somewhere in the kiddie pool area. 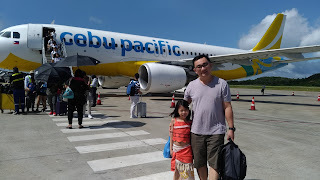 My daughter still had a fun afternoon but we ended up not getting a decent shower because people trooped to the shower area all at the same time ; p As usual, we were back in Manila in less than an hour. Thanks to the light traffic in NLEX! Sitio Antonio Adventure Activities are CLOSED every MONDAY due to regular checking and maintenance.The Zip Line, Rappelling, Rock Climbing and Aerial Walk are open every Tuesday to Sunday. P100.00 only each activity! 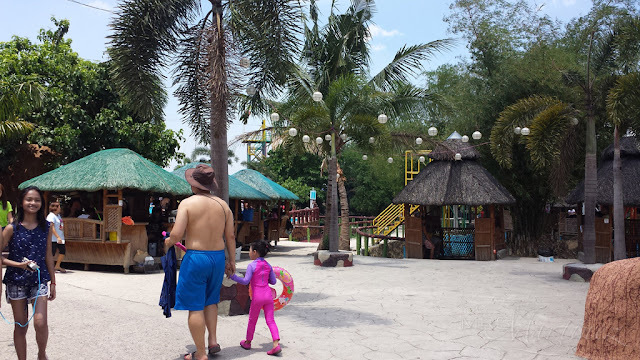 Sitio Antonio Wavepoo Resort is located at Bagong Barrio, Pandi, Bulacan. For inquiries, please call 0975 155 7117, 0908 879 6910, 0933 245 2292 and 0905 155 6667.